Narset is the Khan of the Jeskai. Although younger than the other Jeskai Elders, she leads her people against the other clans. 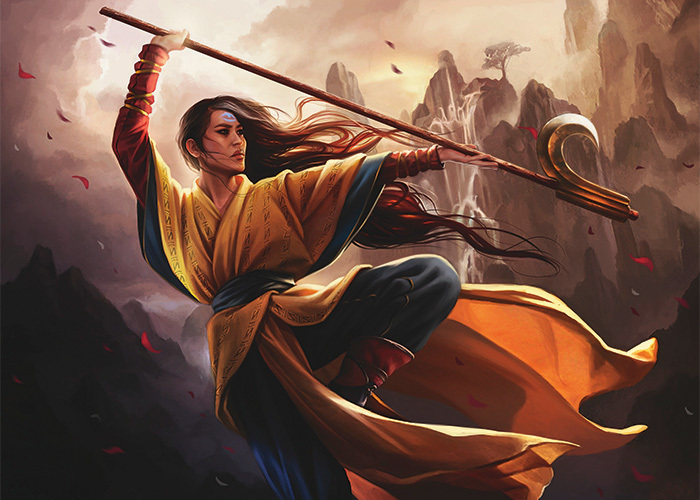 More about the Jeskai can be found in Part 1 of the Planeswalker's Guide to Khans of Tarkir. 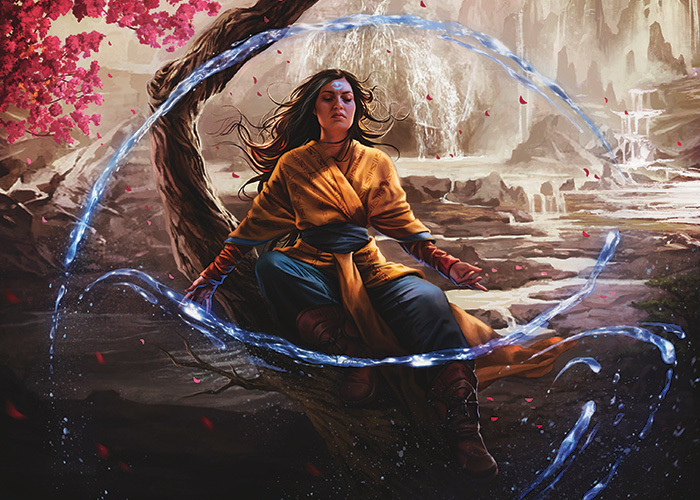 Life on Tarkir is difficult, and it takes its toll on Narset as it does on everyone else—she just has practice with hiding it. She seeks to bring peace to the clan, and studies Tarkir's history for the answer. My legs were asleep. I haven't had this problem while meditating since I was a student. I wasn't focusing. To the hundred monks who meditated in the plaza with me, I was motionless, meditating as I always did. But just because I look quiet and serene doesn't mean I am. Just because I don't show emotions doesn't mean I don't have them. And it's not that I can't show them; it's that I'm not supposed to. My mind was racing, as it often did. Others would stop this, but I let it run. I would pretend I was at peace, as I knew other Jeskai did, although I made sure not to betray my quiet contemplation. As a young girl, I had the same "problem," as my teachers called it. I always lived in my head, but not in the way the instructors wished. I dreamt of fantastical worlds and used the scrolls given for lessons to draw them, incurring the wrath of my elders. I found solace in my own mind and often had difficulty knowing how to talk to others. It was as though my mind was always five steps ahead of my mouth. It was so taxing interacting with others. I never knew what to say, often causing me to blunder, and I was embarrassed in front of my teachers and classmates. I then went over those failed interactions in my mind, and I found the imaginary worlds more forgiving. Studying was a way to escape my anxiety and I eagerly embraced history and philosophy, memorizing all I could about Jeskai teachings. I impressed my teachers, but I still felt like an outsider. I did enjoy sparring with those who had taunted me, easily humiliating them in combat as they had humiliated me with their words. When I was old enough and passed all the physical and mental tests, I undertook the Way of the Wandering Warrior. I was able to learn about the other clans through observation and unfortunate events, where I was forced to fight and kill rival clan members for my own survival. I saw that Tarkir was a divided and brutal place, and took this perspective back to my people. Over the next few years, my counsel was sought out by many regarding these matters, until the elders saw to appoint me the khan of the Jeskai. I had fought the clans in battle and knew their tactics. Even though I am now their khan, I still felt like an outsider—like the young girl always fumbling her words—only now I don't show it. I think this has been what gives me the strength to do what is needed, looking at the Jeskai like I am not really a part of them. I sat in front of a room of the other Jeskai monks meditating, as they meditated with me. I knew they would be deep in thought, so I opened my left eye to look around. The other monks were arranged in a square, all cross-legged and meditating—except for one child. He was dressed like a monk, although his robes were slightly too big, and he was not even a decade old. He was looking around, clearly bored. The boy saw me looking at him and his eyes went wide. I stuck my tongue out quickly and he covered his mouth with both hands, apparently trying to stifle a gasp. The monk who sat next to the boy repositioned himself slightly, and I could see the monk's facial muscles tense, which meant he knew the boy wasn't meditating. The boy closed his eyes and went back to meditating, but when I opened my eye again later I saw he was still watching me. This time he stuck his tongue out at me. I allowed myself to smirk. I tried not to think about how in just a few years he'd be on the frontlines fighting against our enemies. A bell rang, which signaled the session was over. The monks turned their attention to me, waiting for me to speak. "Our own selves are the greatest obstacles to enlightenment," I said. "True understanding of the universe comes from understanding of the self. Pretension and malice obscure that understanding, so we must strive to banish them from ourselves and from the world." I hate these sayings. They were part of the tradition, but they don't really mean anything. It was a vague truth that had some bearing on reality, but it made me uncomfortable to have to give out wisdom when sometimes it was better not to say anything at all. They should find these lessons on their own, yet they rely on me to tell them how to be enlightened. I just need to make sure I don't sound foolish. I've come to see the Jeskai need that direction—philosophy for lorekeepers to debate about for years to come. I guess it's what separates them in their mind from the decadent Sultai or the lawless Mardu. The monks bowed and stood, beginning to file out of the plaza. The boy looked back, and I was able to quickly stick my tongue out at him again. The plaza was outside on the mountain, although it was considered part of the Sage Eye Stronghold, which was only a quarter-mile hike away. My personal guard, Shintan, nodded at me from the edge of the pavilion. Custom dictated I was meant to mediate on my own after this daily group session. Although Shintan was meant to keep me safe, I knew his other job was to serve the elders and make sure I was observing ceremony. Shintan was assigned to protect me shortly after. Although custom dictated that he must wait outside the plaza, he had the occasional vantage point to make sure I was present. He nodded at me after the last monk left, and I nodded to him. As soon as he turned his back, I spun and stood, reaching behind some of the ornate statues. I quickly constructed my decoy, dressed in the same clothes, complete with a melon for a head I had stored here the night before. I wasn't going for realism up close, but at the distance Shintan was it looked as realistic as it needed to be. I moved fast out of the opposite end of the pavilion, which dropped off as a steep mountainside. It was easy enough to scale and I made for the stronghold. The Annals were found in the lowest section of the stronghold. I had easily become preoccupied with the relics and ancient scrolls within. I understand some might have thought I was neglecting my duties. 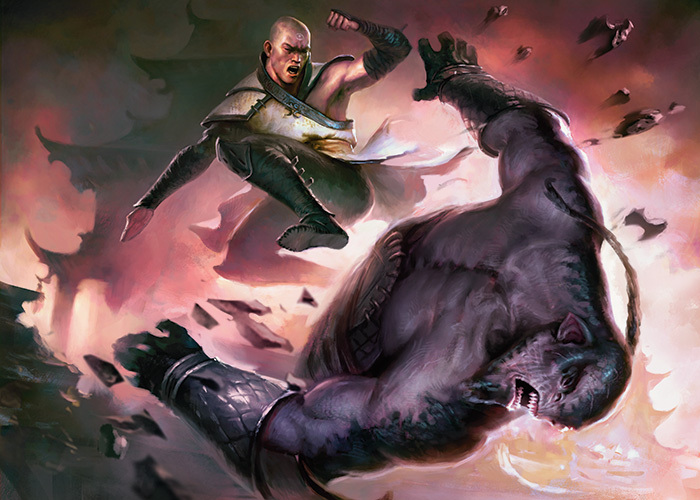 Every day, there are reports of Sultai and Mardu aggression against us, and news of the Temur and Abzan clashing. The fighting was getting to a breaking point. Resources were becoming scarce. The Annals dated back a thousand years, at least, and spoke of the time of the dragons. Although they intrigue me, I was fascinated not by the ancient predators, but by the reports of the clans working together to defeat the dragons. But I couldn't find how they worked together, only that there was fierce fighting and then the dragons' power began to wane. I learned that a dragon named Ugin was connected to Tarkir in ways the khans couldn't comprehend, and that some had claimed Ugin was gone, but not dead. The runes of the Spirit Dragon were indecipherable, written in an ancient language that was neither dragon nor clan—bizarre patterns etched in stone. It was dark in the tunnels beneath Sage Eye, and I only had a candle, but I did as much as I could to learn about the dragons Ugin and Bolas. I ran quickly along the sharp rocks, keeping off the path, as I sprinted back toward the pavilion. I had to hide for a few moments as a mantis rider flew by. I made it to the rock face and climbed back up to the pavilion to find eight Abzan orcs standing within. Each was armed with a blade, and two of them were archers. They didn't see me, and I hid behind a pillar. I was able to see that two of them held Shintan. My decoy had been broken in pieces, bits of stick and hay everywhere, with an arrow in the melon that would have been my head. "You knew we were coming, monk," the head orc yelled at Shintan. "Where is Narset?" Two orcs held Shintan, one on each arm. I could tell the orcs were contorting his bones painfully, bending them behind his back farther than should be possible, but Shintan showed no reaction. I also saw the orcs had not had a kind trip through the mountains. They were a desert folk and the rugged, cold journey had weakened them. 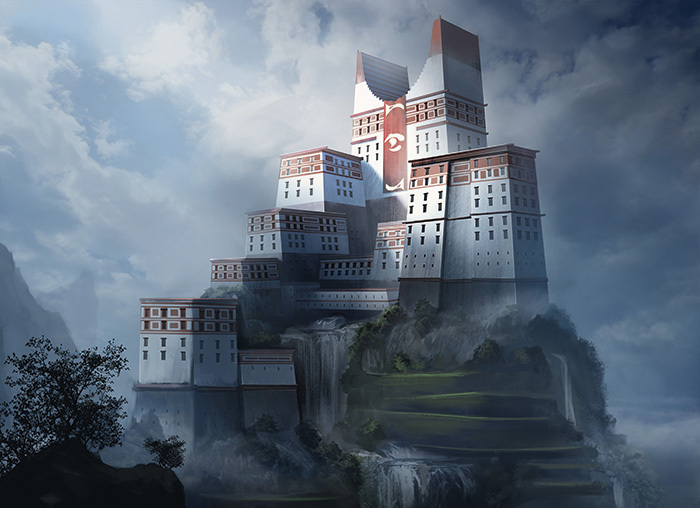 But I was impressed by their resolve, as they had avoided aerial patrols of aven and mantis alike to get to here, one of the most isolated areas within Jeskai territory. 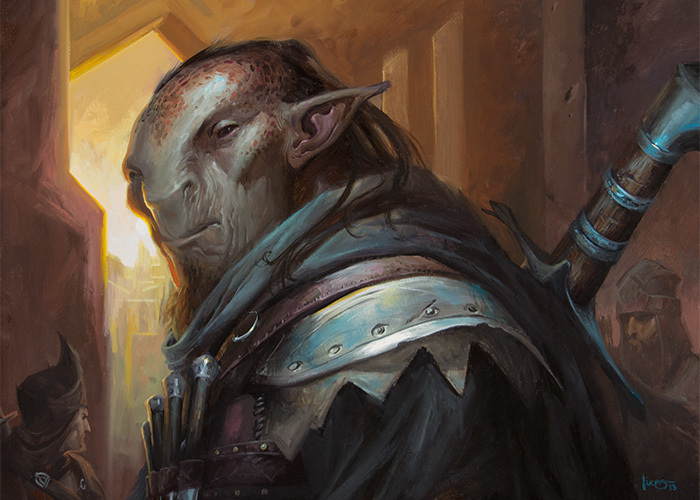 Based on their armaments, these orc were not true Abzan, but Disowned—those exiled from the Abzan. I had no weapons, but I had the element of surprise and years of training on these would-be assassins. I ran quickly from behind the pillar toward the three orcs closest to me and leapt forward into the air, placing both hands on the center orc's shoulders. Springing up, I kicked both of my legs out to the left and right, connecting powerfully to the heads of the other two orcs as I vaulted over the third. I landed in front of the orc and spun around, striking left of the center of the orc's chest, having timed his heart's pumping to stop it with my palm. The other orcs barely had time to react. Shintan took the chaos as a chance to reposition his leg and shift his weight, causing the orcs holding him to topple over. He was able to kick one in the head, knocking the orc unconscious. The other orc righted himself and yelled, but Shintan stood in a fighting stance, unmoving. I could tell Shintan sensed the malice in his opponent, but he did not strike until the orc's muscles tensed in preparation to throw the first punch. I focused on the last three orcs. The head orc rushed forward with his large sword raised above his head in a frenzy toward me, ready to cleave me down the center. As the orc swung his blade down, I delivered a swift kick to his throat. He dropped his sword in panic, and I clasped both of his wrists and shifted my weight to redirect his movement, spinning him around. He was larger than me, but I had hold of tender muscles on his arms, and was able to control his general movements. When the last two orcs attacked, I was able to fight them with their own commander as a weapon, guiding the fists of their superior officer to crack their skulls. Shintan had defeated his other would-be captor, and I spun my orc around to meet my bodyguard's fist. The orcs lay, some dead, all bleeding, on the marble floor of the sacred temple. We both caught our breaths. "I made the orc talk before I put him down," Shintan said. "He said he and his kin were hired by the rat Taigam. He claimed you sent assassins after Taigam." Taigam, my old pupil, who had betrayed the Jeskai to seek riches with the Sultai—he could have given them the information on how to move through Jeskai lands. I hadn't sent assassins, but that didn't mean another Jeskai hadn't. "I had no knowledge of any assassins," I said. "I will have to tell the elders you left your meditation," Shintan replied. I motioned toward the fallen dummy. "Then I'll have to tell them they got the drop on you and I'd have taken an arrow through my head." He glowered, then moved to secure the unconscious orcs. The orcs were imprisoned, and all told the same tale, that Taigam had hired them as retribution for an assassination attempt. The elders were eager to accept the orcs were lying, most likely to cover the treachery of one or all of them. Shintan said he feared there would be others, but I showed no fear. Taigam was not the only one who wanted me or the Jeskai dead. I saw that my own people plotted the deaths of others. Taigam and the elders were symptoms of a larger problem. Tarkir was sick with war. Maybe the ancient runes of the dragon Ugin would hold no answer. Maybe the world was doomed. I meditated atop a mountain peak, ignoring the snow and cold winds as the sun rose and its warmth touched my skin. I was far from Sage Eye, from my devoted followers, from the elders, from Shintan, and from responsibility. I melted away from myself, no longer looking for an answer, but waiting for it to find me. In my mind I saw darkness and knew peace. I'm not sleeping, but I dream. The worlds from my youth rush toward me.